A Tonk's Tail... err, Tale...: New Patent! Scratching Pheromone for Cats! Cats love to sharpen their claws. It's instinct. Built into their DNA. They do it to exercise those all-important muscles used to extend and retract claws for climbing and hunting. Scratching also helps a cat shed old, dead claw sheaths and to maintain that razor-sharp edge. But they also do it to send a message. And those messages cats send to one another through scratching were the subject of a recent study. This study was published a few months ago, in the Journal of Feline Medical Surgery. One of its authors is Dr. Patrik Pageat of the Research Institute in Semiochemistry and Applied Ethology. According to their web site, the Institute is a private research organization dedicated to studying the behavior of animals, humans and their interactions. Their specific focus is on the way people and animals communicate through body chemistry, or the use of chemical signals (also known as semiochemistry). Did you know there's a whole world of social messages being sent back and forth each day all around us, wrapped in chemical secretions? For instance, semiochemistry is what a tick uses to find its victims (eww). A tick will sit in tall weeds or bushes, waiting for a mammal to pass by. When the tick scents butyric acid - the scent that emanates from the sebaceous gland of a mammal (human, dog, cat, horse, goat, etc) - then the tick has found its prey. 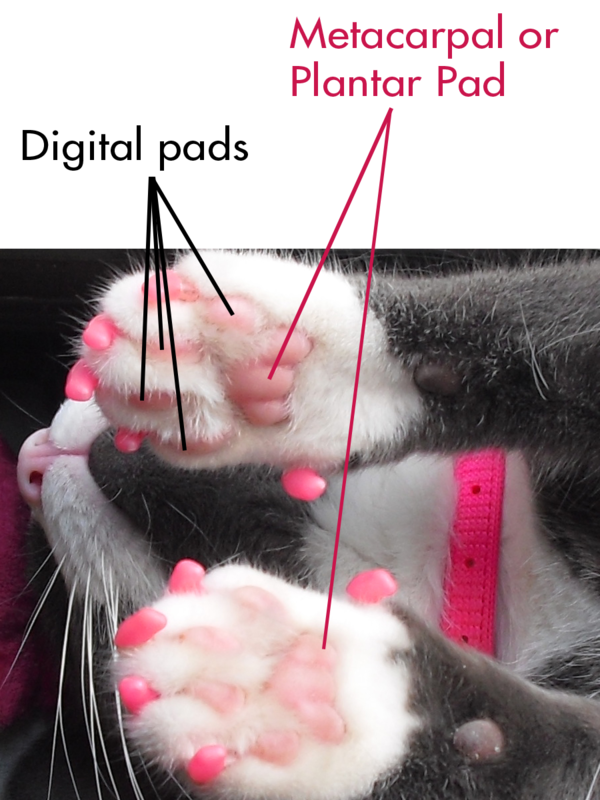 Well, cats have scent glands in lots of places, including on the heart-shaped plantar pad complex on the underside of their feet. And when a cat scratches the bark of a tree or uses a cat scratcher, a scent is released from that plantar gland. The scent is known as the Feline Interdigital Semiochemical (FIS). Experts suggest this scent is used by a cat to mark territory. Dr. Pageat's study investigated how FIS impacted what a cat scratched, how often and for how long. In fact, his study introduced a synthetic form of the chemical to see if it had any impact on the cat's scratching behavior. You can read more about the study in the article the Winn Feline Foundation posted on it last week. "The results seem of interest in explaining the role of a FIS in inducing scratching behaviour on a scratching post. The semiochemical approach can modify the choice of areas selected spontaneously by cats, and could be used either as a preventive measure for a cat arriving at home or to control or change an inappropriate scratching behaviour." This is encouraging news. Anyone who volunteers at a shelter or rescue has probably witnessed a cat being surrendered by its owner because of "behavior issues." In fact, scratching on non-designated surfaces (e.g. on furniture and not the cat scratcher) is listed as one of the top reasons cats are surrendered to U.S. shelters, according to a 2000 study in the Journal of Applied Animal Welfare Science. So the news about a patent for a synthetic FIS application specifically to discourage cats from inappropriate scratching comes as fantastic news. We can't wait to see this product developed and in use!! Our thanks to Dr. Pageat and the researchers at IRSEA for pioneering a product that could potentially save hundreds - thousands - of cats. "Behavioral Reasons for Relinquishment of Dogs and Cats to 12 Shelters," Journal of Applied Animal Welfare Science, 2000. I get the posts from the Winn Foundation too, saw that and thought it was very interesting! Interesting and we never knew that scratching is one of the main reasons cats are surrendered to shelter. Have a marvellous cool Monday. We don't scratch but think this is pawsome news! We had one very bad cat who would scratch everything BUT the scratching post. We did not surrender him but he was a challenge. The Farm cats are very good and only scratch their posts. That is truly great news....!! Interesting - would be grand if this development helped with the problem of cats being surrendered to shelters just because they are following their natural instincts. Interesting. We are lucky that our kitties only scratch on their designated scratching posts. Wow, they are so clean!! You should give my boyz some lesdons! We scratch on the designated posts... Plus a couple of other things. MOUSES! Thank you for the info. This could change lots of lives! Very interesting! We will be curious to know how well this product does. Thanks for sharing! That was fascinating. Thank you so much for sharing that. Oh, that's really cool! We hope it comes to market in a consumer-friendly way that allows it to help a lot of kitties who would otherwise be at risk of losing their homes for not scratching where they should. Oh, this would be fantastic! Please, let us know as soon as something is available! Please! ....ppllleeeeeaaasssee! That is really cool. You're right, we see so many kitties come to the shelter because of "behavioral" problems. We'd love to see this developed into some end-user product! I'm really excited to read about this! As hard as I've worked with Waffles, he still will occasionally scratch where I'd rather he didn't. I read this from Winn Feline Foundation too and can't wait to look more into it--thanks for researching and sharing! Not just for everyday cats, but for rescue cats in foster homes who need to learn good manners while looking for a forever home, this is invaluable. fascinating.. wouldn't it be nice if this does turn out to have every day practical applications.